Has Tiger Woods failed us? Till just the other day, these two words meant something special to everybody all over the world, but “Tiger" and “Woods" in conjunction now describes something other than the greatest golf player to have walked this planet. You know what I am referring to, of course. We are witness to arguably one of the biggest scandals to have hit the sports world, and if you are one of those who shies away from sports pages and sports TV, surely you could not have escaped the post-mortems that have inundated the media over the past couple of weeks. 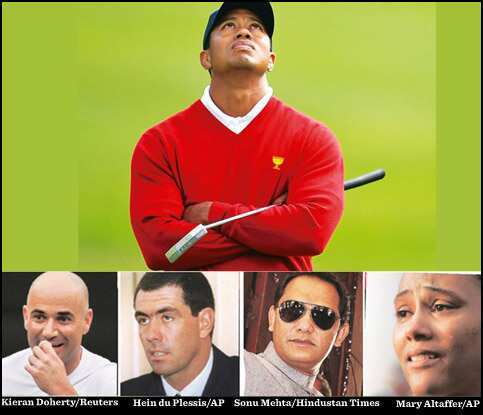 Fallen heroes: Woods (top) is the latest example of sportspersons involved in scandals and controversies; others before him include (below, from left) Andre Agassi, Hansie Cronje, Mohammed Azharuddin and Marion Jones. Most of the jokes have been corny, some outrageously funny—and I am not referring here to the speculation that Tiger and Elin Woods will, in due course of time, arrive at the altar of Oprah Winfrey to cleanse their souls, though that is not without humour either. In the surreal world where celebrity and materialism meet, Oprah is the goddess of confessionals. Give or take $80 million, or about Rs370 crore (which is what Woods is reportedly ready to pay Elin for staying married to him for six years), all wrongs can be corrected on this show, which seems like jolly good fun all around. Among the more rib-tickling ones I have come across is from David Letterman in which the celebrated talk show host says, “President Obama is sending troops to Afghanistan. Hell, he ought to be sending them to Tiger Woods’ house." Given the current disposition of the beleaguered golfer’s wife Elin, I wonder whether even these troops would stand a chance. But I am being facetious. This is serious stuff. This is about why and how sports heroes fail us. This could also be about whether we fail our sports heroes. At one point in his show, Letterman quips that he wishes Woods would stop calling him for advice. Looked at another way, this is deadly serious stuff masquerading as a joke. Everybody knows of Letterman’s scandal about dalliances with women in his workplace which had led to a $2 million blackmail case that had grabbed headlines only a few months earlier. He had beaten the rap by coming clean on television. And therein is the tragic component of the Woods saga. Of all our heroes, those from the sports arena are assigned the most daunting virtues as role models. Letterman’s transgressions can be rationalized. Surrounded by fame, money and so many women, the temptation may have been too much to resist. Ditto politicians, and to some extent, even clergymen. If rock musicians and filmstars don’t lead wild lives, surely something is wrong with them. But sportspersons are imbued with the extraordinary qualities that ordinary mortals either do not have or cannot live up to. Society vests in them virtues to which it can only aspire, never fulfil. They are deemed heroic not only because they have special skills, but also great valour, honesty and a sense of fair play that is beyond the pale for most of us. When such a role model is seen to have the same follies and foibles as anybody else, the disappointment is so acute as to leave us crushed. It is an unreal expectation, and the history of sport is littered with so many examples of flawed and failed sports heroes, that it seems remarkable that sportspersons should be seen as paragons of virtue at all. Olympic sport is infested with drug abuse; soccer, baseball, cricket, tennis—to name only a few other disciplines—with corruption. Bad behaviour and cheating are rampant in almost every sphere of sporting activity. Even a cursory sweep of modern sport shows how endemic the problem really is, and that Wood’s transgressions were really limited in damage to his own persona, not the sport. For instance, O.J. Simpson was an all-American hero till it was alleged that he had murdered his wife. His melodramatic arrest, after a widely televised car chase, and subsequent trial marks one of the great media sagas of our times. When the match-fixing scandal broke in cricket circa 2000, the biggest setback was in the people allegedly involved, for Hansie Cronje and Mohammed Azharuddin seemed the most unlikely villains. They had impeccable credentials and squeaky-clean images. They were adored all over the cricket world, not just as captains of their respective teams, but also as brand ambassadors for their countries (in Azharuddin’s case, the matter is still sub judice). Marion Jones, multiple gold medal winning Olympian, seemed the perfect athlete in every way till she was overcome by guilt and confessed to taking performance-enhancing drugs. In a few sentences of confession, she had demolished the myth of clean competition. More recently, Andre Agassi opened up about how he not only wore a wig to hide his balding pate but also lied about taking drugs so as to escape detection during a tournament. The examples are endless. Why people who have the world at their feet would indulge in such chicanery is a poser that ignores the human condition. Naked ambition, greed, disloyalty and other such venal passions rule sportspersons as any they do any other human being, but are camouflaged by diligence to keep the image intact, often because of the sheer pressure of expectation from the public. In professional sport especially, where money is now plentiful, “millionaire athletes become corporations on legs, their allegiance primarily to themselves and their sponsors", as an American journalist put it. Image becomes paramount to create an ideal environment which is hard-sold to the public. But veneer of respectability is often just that—a veneer. My cynicism about Tiger Woods, ergo, is muted. His shenanigans resonate no louder than any other human being’s. But he is the greatest golfer who has ever lived. That’s why he is still different from anybody else. Ayaz Memon is a Mumbai-based writer and commentator.